magrathea farm | Bits of it were dullish grey, bits of it dullish brown, the rest of it rather less interesting to look at. 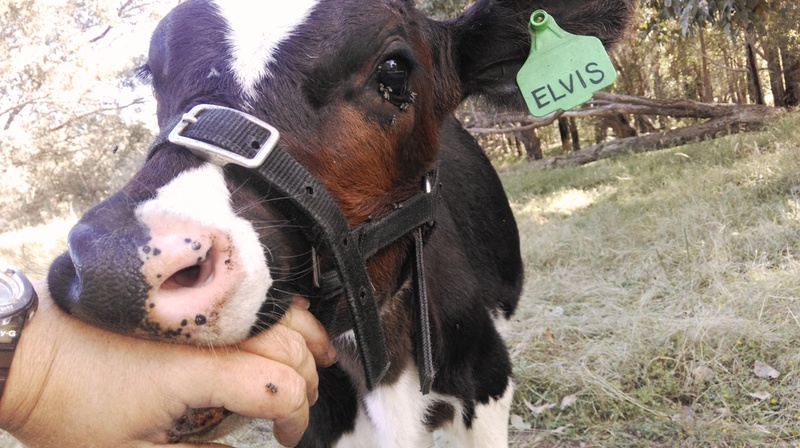 Elvis is now running with the rest of the little herd full time. 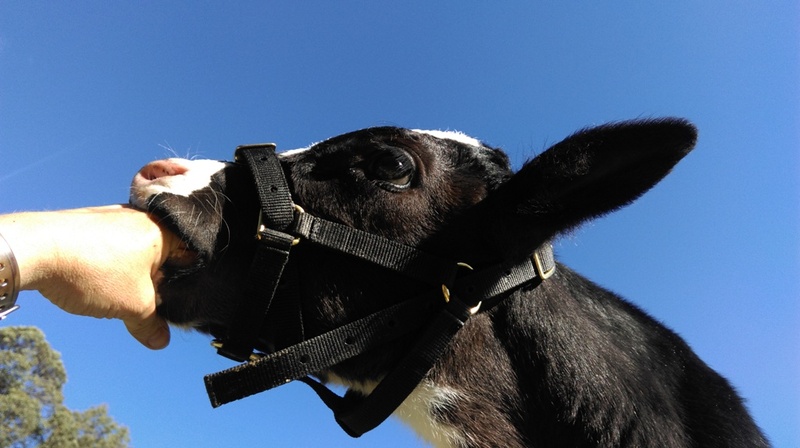 He got milk up until about 10 weeks of age, as well as being supplemented with good hay and weaner pellets. He still gets weaner pellets as much as he likes, he can help himself to them. I’ve rigged up the gate into the calf pen so that only he or the other littlies can get in to the pellets, to keep the gobble-guts Dora and Hotblack out. 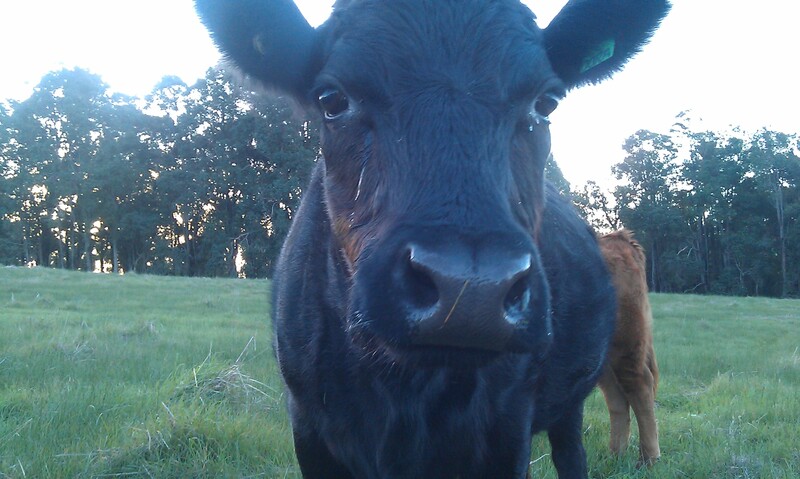 Mostly he hangs around with the other calves. He is a bit slow moving compared to the rest of them, kind of ambles along, so he is often a ways behind them all! He has given me a few scares by not being with the rest of the herd at first, I spent hours looking for him one day, only to find him sitting in the shade up by the dam, while the rest of the cows were on the opposite side of the farm! 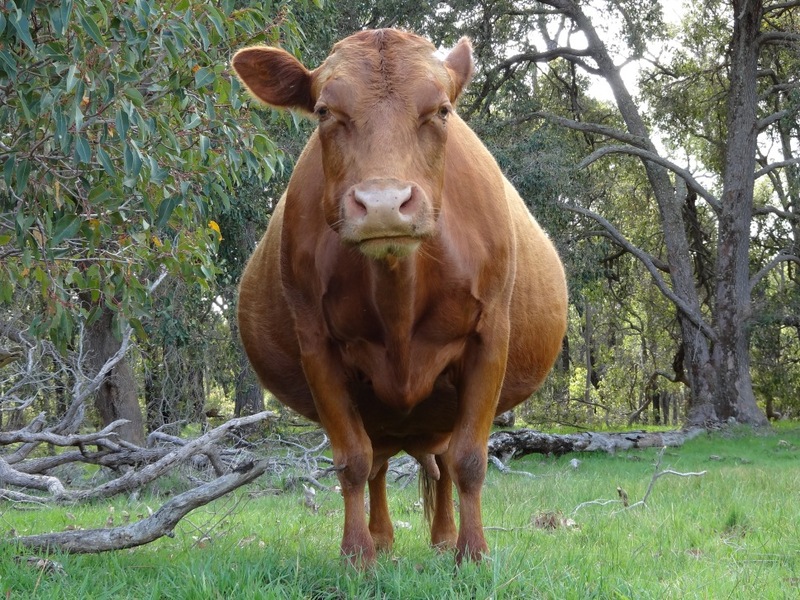 The good thing is, if I call him, he normally answers with a Moo, which makes it easier to find him! He still loves his scratches, he stretches out his head for me to rub under his chin. He also still chews on my hand. And shirt. And anything else he can wrap his chops around. The grass is really drying off now, and soon we will start feeding hay and lucerne silage to the cows again. They do well on the lucerne over summer, without losing condition. They tend to hang about in the creek areas at the moment, as there is still green pick there, won’t be long until it is all dry again though. The flies are terrible at the moment, there’s a gap in late spring and early summer, between the spring active dung beetles and the summer active ones. When the dung beetles aren’t on the case, the flies build up. Apparently the Ag department have another dung beetle they are working on releasing to hopefully fill this gap. I tried to take a photo the other day with the timer on my phone to show how big he is getting! I love Christmas cake but I am also never organised enough to make it well in advance. Like the name of this one implies, this can be eaten the next day. A week or two soaking in the sherry would be nice though. This recipe is adapted from the Australian Women’s weekly “Traditional Christmas” booklet. Line a 22cm round or 20 cm square cake tin with baking paper and several layers of brown paper. Preheat oven to 140 C or 120 C fan forced. Bring to boil, reduce to a simmer for 5 minutes, place in a large bowl. Allow to cool 30 minutes. Mix til combined, then spread evenly in tin. Bake, uncovered, for 3 1/2 hours, or until an inserted skewer comes out clean. 60mL of sherry, whisky, or rum. Then cover the hot cake with foil, wrap in a towel, then allow to cool overnight in the tin. If you are the organised type, this cake can be made three months ahead. Brush with sherry, whisky or rum at fortnightly intervals to keep moist and build flavour. When we moved to Donnybrook, four years ago, we knew no-one. We both still worked away, so the only people we met were the fertiliser guy, the tractor repair man, the next door neighbour, and the post office people (thanks primarily to my online shopping efforts). The first year, I saw an ad in the local rag about how the local “Apple Festival” committee was looking for new members. Hubby gave me the evil eye and warned me to give it a couple of years before I got myself onto every committee in town. So I did. Hey, I was still working, it’s not like I had the time anyway. Plus I thought these things would be run by a tight knit group of control freaks people who have been doing it forever and who would not be open to new inputs. So, fast forward to now, four years on, and I find myself on the aforementioned committee. Yep, can’t help myself sometimes. Turns out they are very much open to new members and input as half of the committee burned out and are no longer involved. A public forum was held a few months back to get community input on the fate of the festival, and a shout out for new members saw me putting my hand up. The Apple Festival has been struggling the last few years, it was called the apple festival but in recent times, there’s been not much “apple” content, despite us being the major apple growing region of the state. Only one orchard has been involved at all. If I am completely honest, I think it has been a fairly ho-hum uninspiring sort of an affair, albeit with a couple of highlights. It is definitely ready for reinvigoration. The district has evolved well past just being about the apple, there are a lot more agricultural products to show off, as well as local artisans. As such the Festival is re-branding next year, to become the Harvest and Arts Festival of Donnybrook. It will be interesting to see and be a part of evolving this festival over the next few years. If I survive this first one. At the first meeting this year, I managed to get myself landed into the position of Groundsperson, by foolishly opening my trap and mentioning that with my background as a surveyor, making a good map of the festival is something I could contribute. Wham, bam, before I can understand what just happened, I am now put in charge of planning the layout of the whole shebang, you know, what stuff in what zones, how each area relates to it’s neighbours, the main stage, food areas, stalls, sideshow, yada yada yada. Eeep. Oh, and making the map of course. Anyone got any tips for laying out a festival? There are thousands of known varieties of garlic in the world. In Australia we have relatively only a few. Garlic comes in all shapes, sizes, colours and strengths and variations of flavour. Sadly, here it is widely known as only white, purple, australian, or chinese, mexican, argentinian, etc! There are some people who hold the belief that white garlic is bleached, and therefore bad. While this may be true for some imported garlic (I really do not know the truth of this) it is not true for Australian grown garlic. There are many many natural varieties of white garlic, including the magnificent Printanor (pictured below) so please, no garlic discrimination based on colour! Imported garlic is fumigated with methyl bromide, as is a lot of other imported produce, and some products packaged for domestic consmption, such as rice. Methyl Bromide is an ozone depleting substance, and is also terrible for human health. Its use is banned in the EU, but still used here in Australia for quarantine purposes. After being used as a fumigant, it readily dissipates into the atmosphere – a good thing for anyone eating the food that has been fumigated with it, but not a good thing for the ozone layer. Currently around 300 tonnes of it is used per year for quarantine purposes according to the Australian Department of Environment. So buy local garlic when you can, grow some yourself if you have the space! Better for you, and for the ozone layer. The distinct odour of garlic is a result of various sulphur compounds. The sulphurous compound particular to garlic that gives it antibacterial properties is known as allicin. Allicin is only present in crushed garlic, not in whole garlic. Alliin is the precursor to allicin, and when garlic is crushed, the alliin is converted to allicin by the enzyme alliinase. It is only after this change that garlic gains its antibiotic and other therapeutic properties associated with the allicin. Cooking destroys allicin, so for maximum therapeutic benefit, garlic is best eaten raw, crushed or chopped, and with minimal heat treatment. Cooked garlic however also includes other compounds that have a range of therapeutic effects, including reduction of blood pressure, anticancer properties, and immune system effects. In short, for therapeutic benefits, garlic is better eaten crushed or chopped than whole, better raw than cooked. For culinary purposes – use it however you please! ‘Elephant Garlic’ – Allium Ampeloprasum – not really a garlic, but a majestic looking plant. You may have noticed from that list that ‘Elephant garlic’ is not a true garlic. It resembles garlic in form, and it also contains the compound alliin. 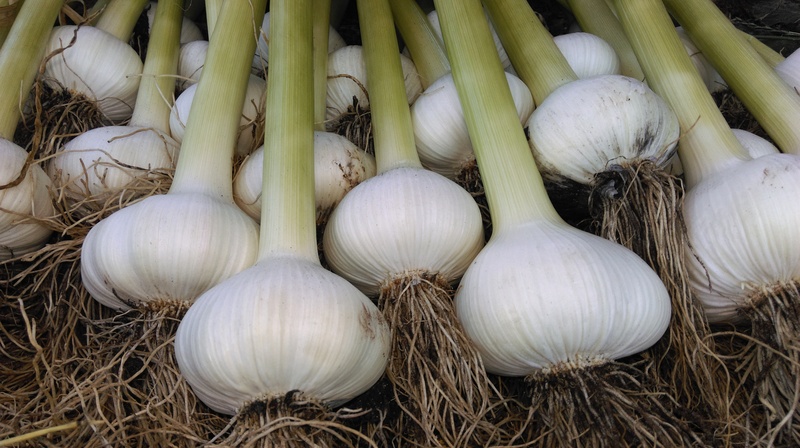 The plant grows much larger, and it produces large bulbs of four or five large cloves, with a mild garlic flavour, but it is genetically different from garlic. As its common name includes the word garlic, it is easy to see why most people would think that it is a garlic. It does have a bit of a garlic-like taste, but for many fans of garlic, myself included, it is a poor imitation. Generally it is accepted that there is only one species of true garlic, Allium sativum. The classification of garlic below the species level gets rather complicated, and I won’t delve too far into that here. 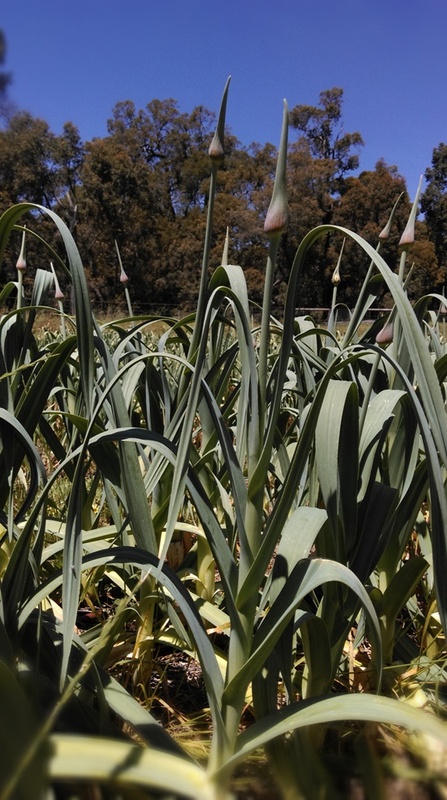 Garlics can be classified as either bolting (hardneck) or non-bolting (softneck) varieties. The hardnecks produce a scape, which is a long, tall round central stalk with a flower-like spathe that forms on the end. 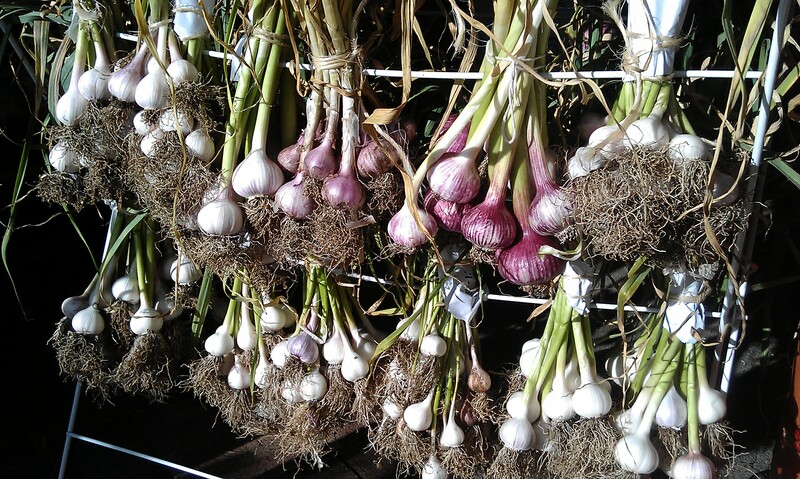 The softneck garlics usually do not produce a scape, but may do under certain conditions. Hardnecks include the porcelain & rocambole groups, and a few others including purple strip, artichoke, marbled purple stripe and asiatics. Softnecks include the creole, silverskin, and turban groups. The spathe is a flower like structure, but not actually a flower. It bursts open to reveal a cluster of bulbils, which are like tiny, miniature bulbs, and are not a true seed. Garlic can be grown from bulbils, however it will take two to three years to form a fully differentiated bulb. Growing from bulbils is a good way to refresh planting stock, as many diseases cannot be transferred this way as they can by planting cloves. The term ‘seed garlic’ is common, and usually refers to garlic cloves for propagation. True garlic seed can be obtained, but the process is laborious. First the bulbils must be painstakingly removed to allow the flowers to develop. Then after pollination, the seed can be collected. There are a lot of dedicated people around the world working on growing garlic from true garlic seed (TGS). The beauty of this is that as it is not clonally propagated, you could end up with a wonderful new, genetically distinct variety of garlic. I hope to have time to work on this one day. Garlic is usually planted in autumn, and harvested in early summer or late spring. There are some varieties that can be planted later, up to late winter, and some growers, particularly in southern areas such as Tassie, plant as early as February or March. I am to plant around Anzac day, or as soon as we get the season break – the first decent rain. There is a common saying that one should plant garlic on the shortest day of the year, and harvest on the longest. Ignore it. I am not sure where this comes from, but I do not find it helpful for our seasons. I believe it is true of shallots however. To plant garlic, carefully break open a bulb and separate the individual cloves. Plant them at 10 – 20cms between the plants, in rows 20 – 40 cms apart. This year we have sown our garlic at 12 cm x 30 cms, and this works for us for ease of weeding and irrigation. Garlic needs to be kept moist, but not wet, throughout the growing season. It doesn’t like boggy wet ground. It needs sun on its leaves in order to form good sized bulbs, so plant it where it will get plenty, 6 hours a day or more. It doesn’t like weed competition, especially taller weeds that will partly shade the leaves. It’s not a high nutrient demanding crop, but give it a little complete fertiliser throughout the season, and a bit of potash in spring to encourage bulbing. I give mine a few handfuls of Eco Growth NPK and composted manure at planting, 5 foliar feeds of Nutritech triple ten, a fortnight apart in the spring growth flush, with one feed of a liquid Calcium/Boron, and a bit of Potash in mid spring. Then I leave them well alone until harvest. 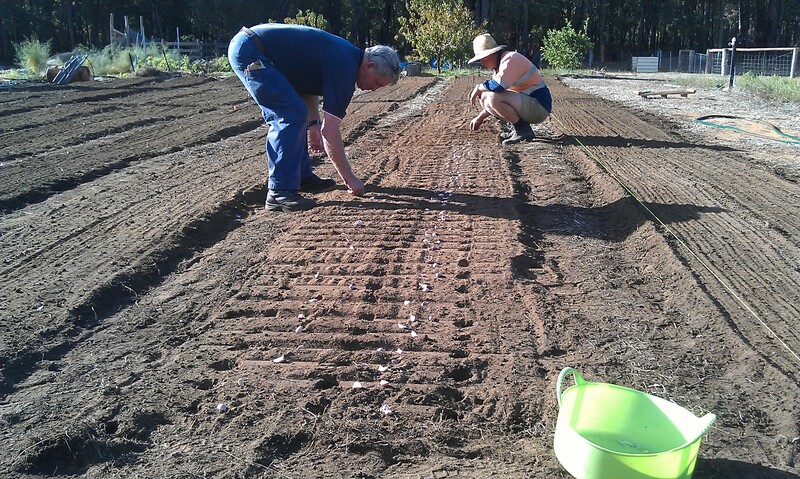 Most garlic is cold tolerant – indeed, in Australian level of cold conditions anyway, and some varieties need a period of cold in order to successfully bulb. 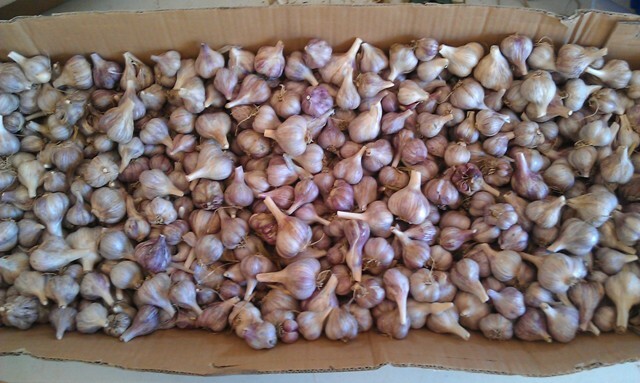 In choosing what garlic to plant, you are best off obtaining planting stock from a grower near you, that way you will be getting a garlic that should do well in your local conditions. In late spring, the leaves will start to die back, starting from the lower leaves. When this happens, restrict watering or cut it altogether if the soil is moist. When about half of the leaves have died off, then have a little dig down along side a plant to see if you have nice swollen bulbs. If you do – then it’s time to harvest, if not, then leave them a little longer. Keep checking, garlic tends to put on a lot of size in a very short amount of time. I am digging to check out my garlic all throughout the last few months of the season. 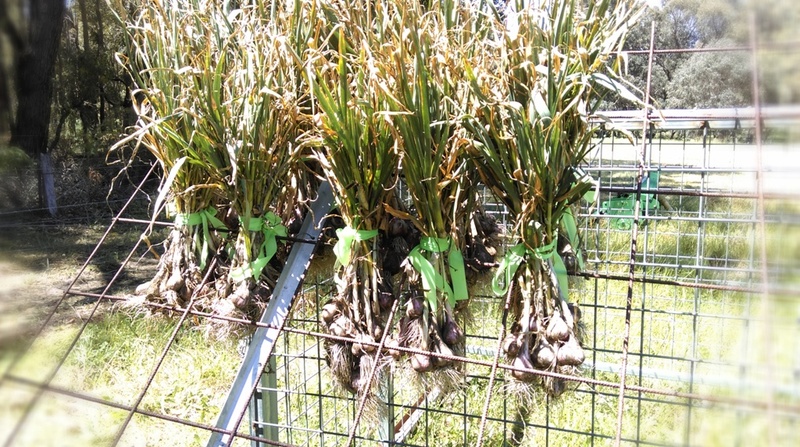 Once harvested, bundled them and hang them, bulbs down, in a shaded, airy place to cure for a few weeks. Then slough off the dried outer skin, trim off the roots and the leaves if you desire, and store in a cool dark place. Garlic should not be stored in the refrigerator. We simply store them in cardboard boxes, not too deep with bulbs, in our ‘back room’, at room temperature, even in the heat of summer. 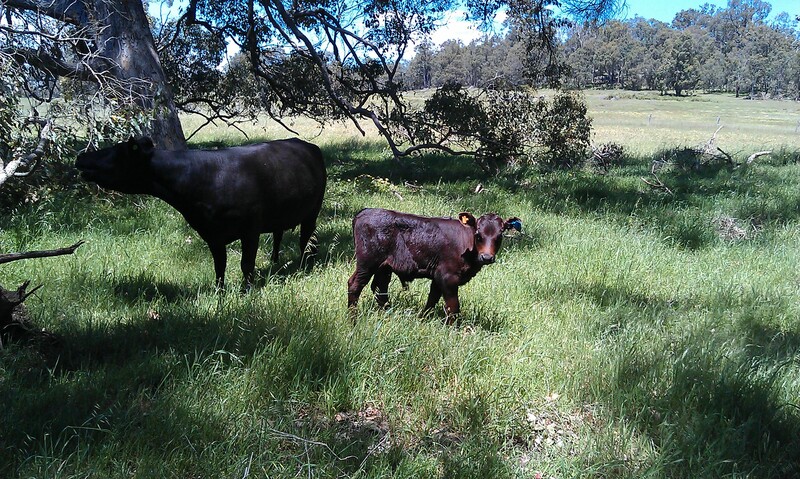 We bought Millview Dora Belle two years ago to expand out little herd of three. Dora is a lot shorter, and finer structured than the others. She’s really quite tiny, but is a ‘long legged’ dexter, not a short (I will explain later in another post). 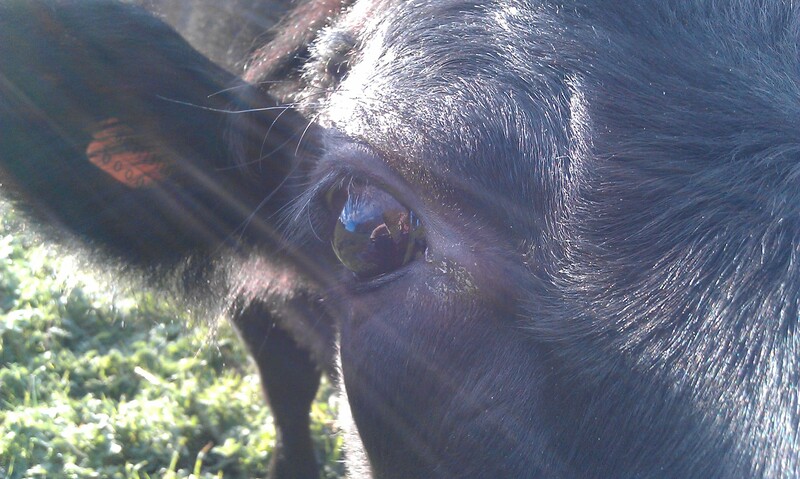 She is a de-horned black dexter. 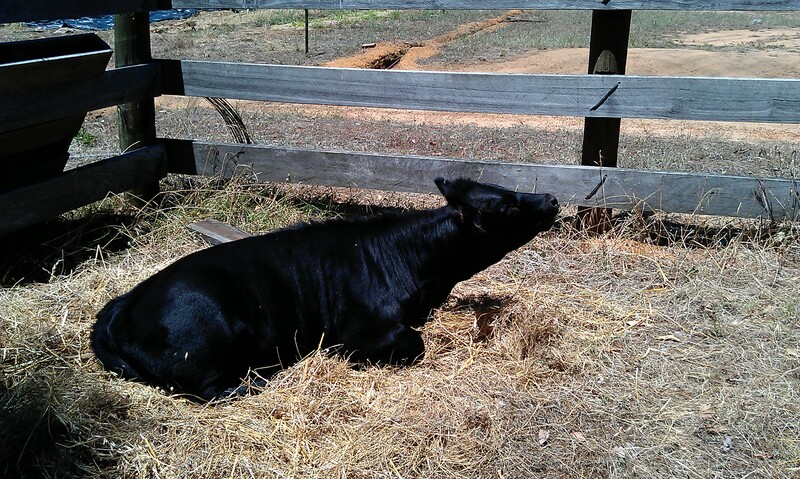 When Dora came to us she was pregnant, to Dougall, and she had a heifer calf, who we named Hotblack. She is HB for short. 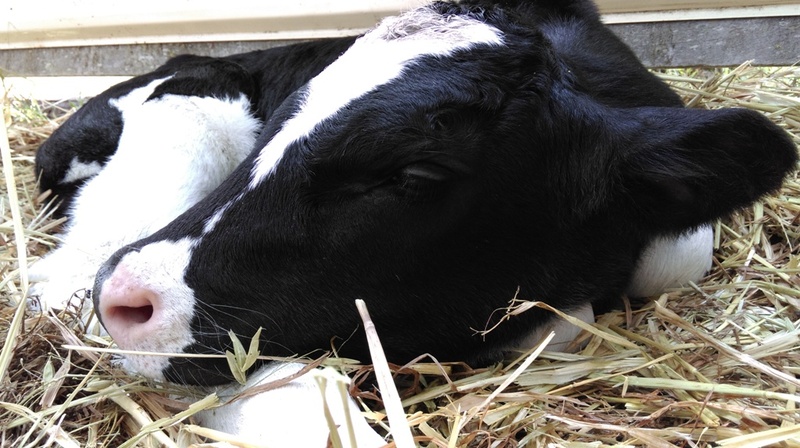 With dexters, each year the calves born in that year are named with a designated letter of the alphabet, which increments every year. G-Zeus was born the year before HB, in the “G” year. Hotblack was born in the “H” year. This year was a “J” year, as the letters “I” and “O” are skipped for some reason. 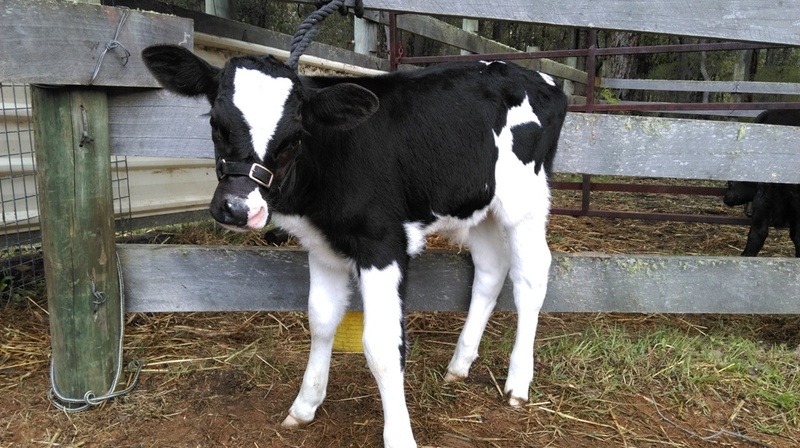 The good thing with this is you can tell the age of a cow by it’s name, simply count up the number of letters from their name to the current naming year. As 2014 is the “K” year, and you skip “I”, that will make Dora seven years old this year. 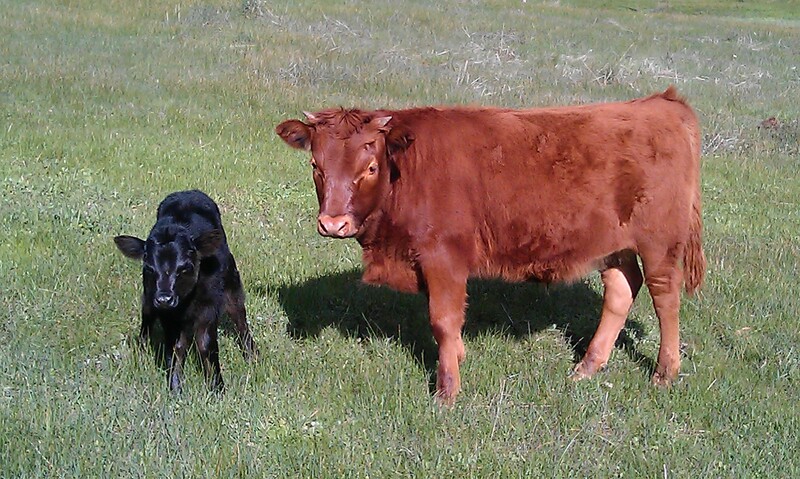 Dora challenges Butterfly for Alpha cow, despite her small stature, she will take her on. She is quicker on her feet than Butterfly too, and beats her to the yellow feed buckets. They used to race for them, but now I think Butters has given up. Dora is a good mother too – indeed they all are really. 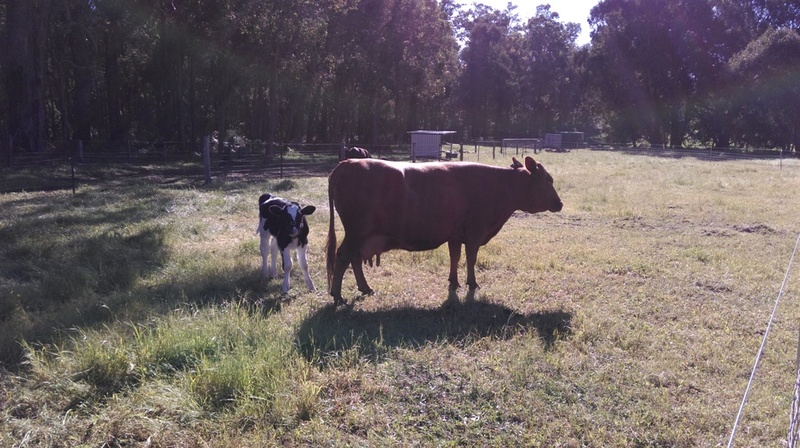 This year she had another heifer calf, whom we named Jacaranda. 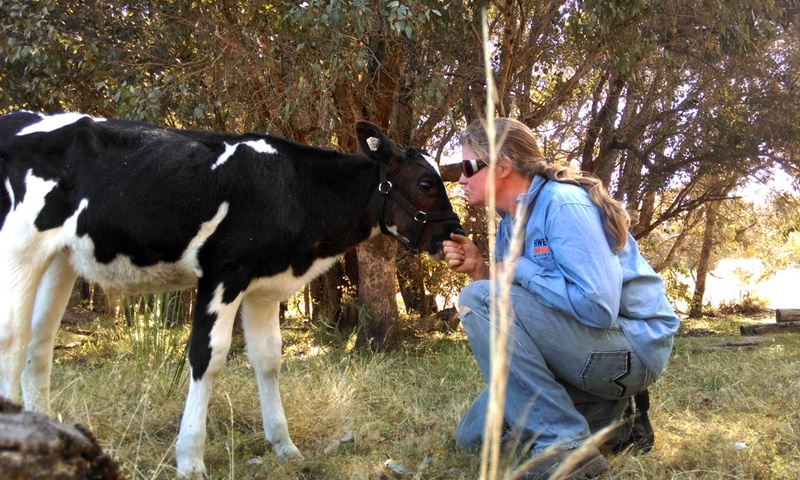 Like her older sister HB, Jackie is very friendly and inquisitive. If this is a trait they have inherited from her Dora, then it is one we are pleased to have in the herd. 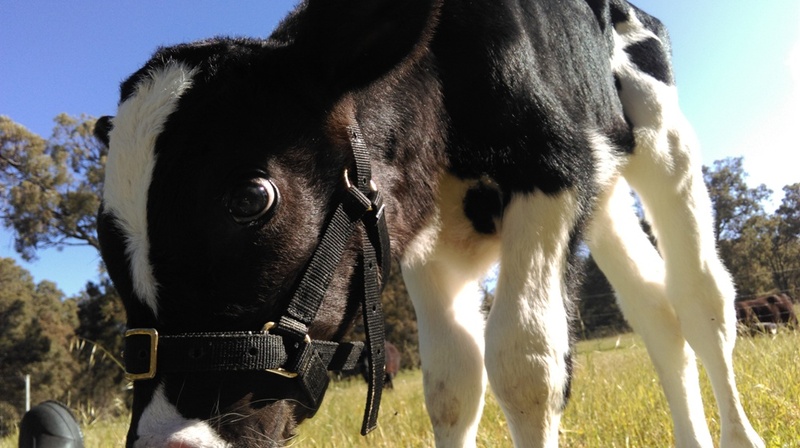 Dora does not object at all to being milked, but has tiny wee little teats, making it difficult. I do have a small milking machine of sorts, but I think I need to get goat sized cups for it for the smaller cows! If I want to bring any of them in to milk, I have to try and get Dora out of the way, as she will race to the head bale in the knowledge that there will be a bucket with a treat in it for her.